This is the 2nd or 3rd lunation I have spent trying to catch this comet and on the morning of October 26th 2008 I succeeded. Sky cleared before dawn, I was up all night anyway so I immediately went outside. The sky was breathtaking, tans 9/10 with a slender crescent Moon low in the east mostly hidden by a convenient strip of cloud. I checked the alignment of the telrad then had a look at M42 to check focus and get the feel for the scope. The nebula was phenomenal. I moved up to the flame, it too was bright with complex structure, I moved back down then picked up, for the first time, what I believe was a glimpse of the Horse head nebula. I have never seen this before visually but I'm sure I did this morning. It's larger than it looks on images. After having a peek at M78 I decided to try for comet Christensen which was well placed in Cepheus. 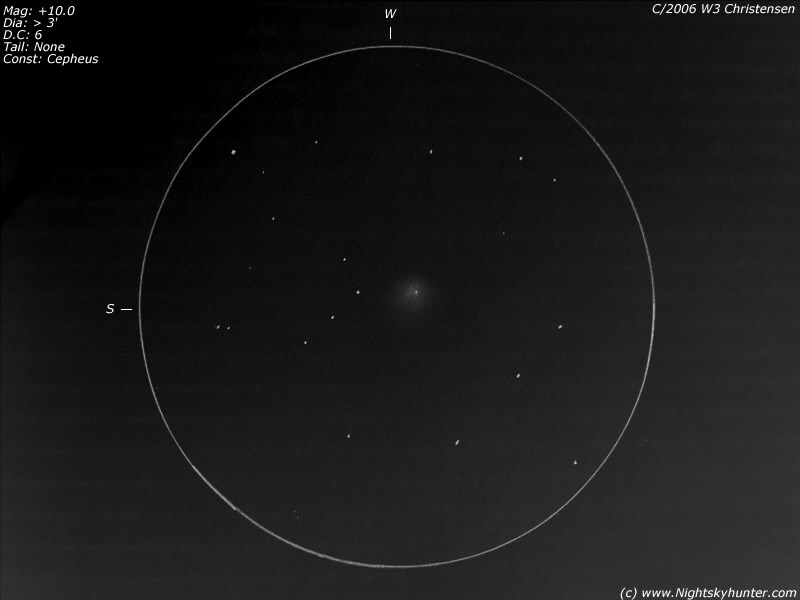 I began a gentle slow search for it through my target area and within min's I found the comet at 05.08 BST. It was a faint hazy spot sitting among a sea of rich stars. It was an elliptical grey haze over 3' in dia at around mag +10.0. It got rapidly brighter towards the middle and had a stellar central condensation at centre. A faint ghostly outer coma surrounded this area. It was well condensed at D.C 6. With averted vision it was easy but direct vision only showed the central region which could be missed at a casual glance. The coma is delicate and requires full dark adaption and a very transparent sky. I made the above sketch quickly. This my 44th observed comet. I spent over 1 hour searching for new comets after this until the sky was too bright. Picked up an abundance of NGC and Messier galaxies in Canes, Coma, and Leo. Also caught M53 close to the Sun. It was a good session. Using an 8.5" F/7 homemade reflector with SWA 32mm 2"eyepiece.